n NYC-based, seven piece combo playing soul with an Afro-Caribbean pulse, San Simón deliver original songs for the mind, heart and feet. San Simón exists somewhere between the deep moods of Soulquarian neosoul, an electric Afro-Cuban rumba, the sounds of 70s Blaxploitation and the intoxicating meters of Kiskeyan roots rhythms and revelry. The band formed in 2014 when guitarist and composer Evan Ubiera sought out a group of like-minded musicians who were also friends from previous musical experiences. Initial song sketches revolved around soul, neosoul and Afro-Caribbean styles, with room for jazz improvisation, all while not losing a focus on songs that could just as well be played and sung on an acoustic guitar by a single performer. A balance of the memorable, the fun and eclectic. The song's twists and turns complement words inspired by urban struggle, self-assertion and heartfelt political manifestos. It can get personal, political and both at the same time. The band recorded a 5 song EP, "Talk To Me". Last year they maintained a residency at Camaradas and playing many other laid back venues in the tri-state area such as the Groove on Grove festival in Jersey City, Silvana’s and The Shrine in Harlem as well as several double bills with sister band, Badinba. 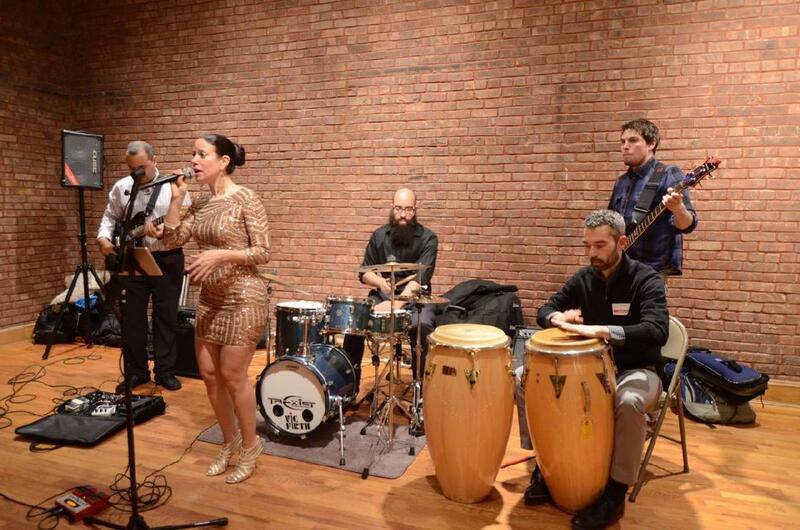 The band has also shared the stage with fellow latin-soulsters Fulaso and Yotoco. A live show becomes a fun party that features the band members pushing the energy over bopping funk grooves, hypnotic clave pockets and rowdy Dominican beats all while JeSanté flexes her pro MC skills on the mic, urging the crowd to move. This is at the end of the day, music for the dance floor. Standing still becomes a challenge! Their sound reflects the distinct musical and cultural backgrounds of the members and their band leader, Dominican-American guitarist and Jersey City native and resident Evan Ubiera.